I have spent time over the last couple of days reading Savage Worlds. 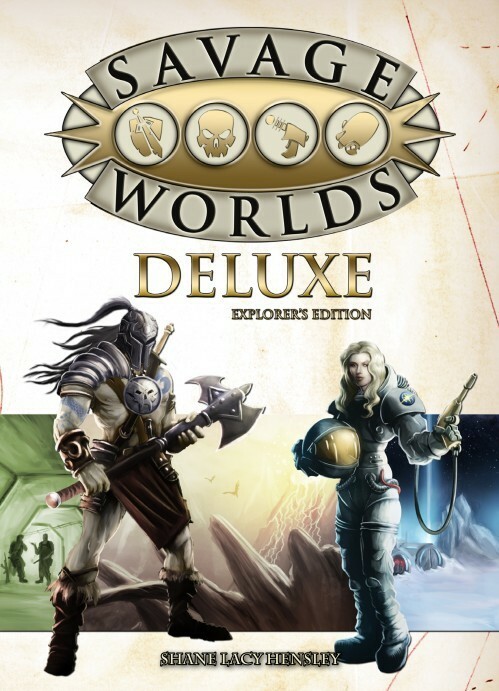 Specifically, the Savage Worlds Deluxe Explorer’s Edition. Now, very much on the positive side, I love a game that you can pick up for next to nothing. Yes, I know… You can find a lot of PDF games and supplements available on the Internet Pay What You Want. And, yes – you can snaffle the whole of Eclipse Phase online for nada, also. Savage Worlds, however, comes in an incredible portable softcover format for about £7 or so. Well, it did when I picked it up. I mean, I can walk into Tesco and pick up two new paperbacks for £7 (on an offer). However, those will be Mass Market volumes likely to appeal to a supermarket audience. This is a roleplaying game. Pinnacle have done incredible work in bringing this book to the market for such a low cost. Along with Fate Accelerated Edition, I have no hesitation in recommended you have a look. Pick them both up and see what you think. However, I say this on the basis that a lot of people say some very nice things about Savage Worlds. Not me, just yet. Plenty of other people, mind. When someone comes on to a community or forum, like a sub on Reddit or a thread of RPG Geek, looking for a good game to start out with or something they can use to run a game of a certain genre, I see Fate and Savage Worlds come up time and again. Thing is, I suspect that people who recommend Savage Worlds probably have a higher stomach for crunch than me. I hadn’t realised before that I definitely don’t digest games well if they have a habit of referring to battlemats or measurements in inches. That bothered me about AD&D, and more recently D&D 4e and Pathfinder. It seemed all too mixed up in the business of wargames. I don’t strictly have anything against wargames. However, I do have to draw the line at crossing the streams and having one tip into the other. If you’re roleplaying through the theatre of the mind, why would you suddenly want to whip out a dry wipe mat and a bunch of miniatures? I’m looking to keep an open mind and get through it. I just hit Chapter Three, and the Game Rules, and will keep on going through to the end. This will be the furthest I have ever read. This reading will not be the first time I have dabbled with the Savage Worlds. Heck, I own two copies of the rules, they’re so damned cheap to pick up. I expect I shall return when I have finished and offer my thoughts. I already suspect I will need to consider ways to trim the modification fat and squeeze out the battlemat measurements. I will have no truck with wargaming witchcraft at my roleplaying table.